Welcome to the MagicWB showroom! This gallery of various users' workbenches will demonstrate the superiority of MagicWB's visual interface style. These are snapshots of real systems, hence screen depths & resolutions vary as different MagicWB users also have different hardware conditions. This will actually show you how well MagicWB performs on different systems. Very decent aqua-look on an A3000. MUI's author demonstrates a clever positioning of device and dock icons. Very beautifully configured system with one of MagicWB's impressive copper patterns achieving a 24-bit look on an A1200 with just 16 colors! Fine usage of MagicWB on a graphics board with multi-color patterns and a photorealistic backdrop. Another nice demonstration of MagicWB on a plain 16 color screen. The backdrop is part of MagicWB's copper effects. 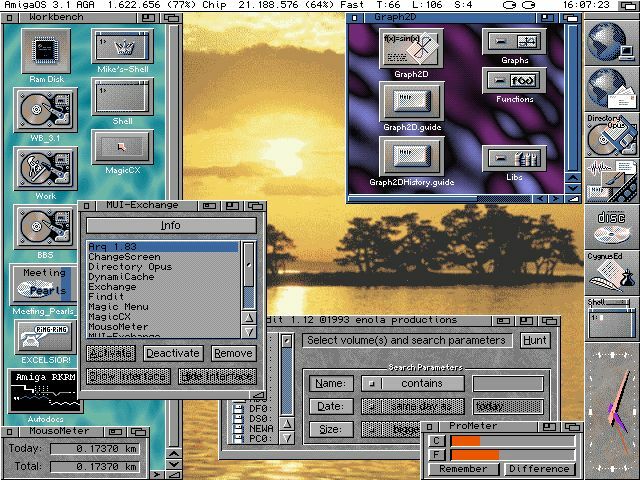 Standard usage of MagicWB on an 8 color screen with MWB patterns and a special presentation of a pop-up menu. A very creative use of MagicWB with pastel colors achieving a "dawn-look". The backdrop fields enforce MWB's light & shadow style. Clever use of MagicWB's gray colors to achieve a nice and soft backdrop on a standard Amiga with 8 colors.